FORT COLLINS, Colo. — Loveland Fire Rescue Authority officials have finalized plans to add two new custom fire trucks, built by SVI Trucks, one of the top fire apparatus manufacturers in the nation. The two new trucks are expected to be delivered before Loveland’s Sept. 11, 2019 opening of its new firehouse, Station 7, slated to serve Loveland’s western rural district. The first custom fire truck will be a Wildland Type 4 apparatus built on a Freightliner M2 commercial chassis and feature a total of three side compartments, as well as OnScene Solutions’ ground, compartment and stairway LED lighting. The new wildland fire apparatus will house a Darley HSE diesel fire pump system, which will feed from a 750-gal. poly water tank, and include a FoamPro Class A foam system, which will pull from a 30-gal. Class A foam tank. The apparatus will feature an SVI folding roof access ladder, Whelen warning and scene lighting and ½” ground sweep nozzles on the front bumper. The truck also features a booster reel with a ¾” hose located under the cab for quick attacks. The second apparatus will be a custom fire engine truck. The new pumper will have a Spartan Gladiator MFD chassis and feature a 10” raised roof. Measuring in at an overall length of 31’ 11”, this pumper rescue will include three custom side compartments. The cab will be outfitted with OnScene Solutions’ Talon helmet mounts. Loveland’s second addition will feature a Waterous CU Midship pump that will feed from a 750- gal. poly water tank, as well as a FoamPro 2001 foam system that will tap a 20-gal. Class A foam tank. In addition, the apparatus will feature a roof-mounted deck gun and Hannay hose booster reel. 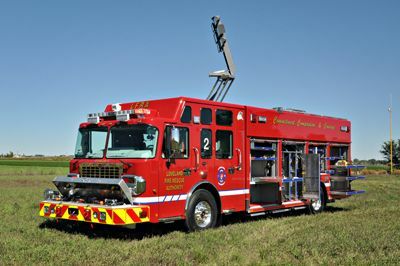 This apparatus will also feature hydraulic tool mounting with OnScene Solutions’ cargo straps, a side ladder rack and Access LED compartment lighting. With the addition of these two new trucks, Loveland will soon garner 10 SVI-built apparatuses. The new rescue pumper marks Loveland’s sixth pumper fire truck from SVI.